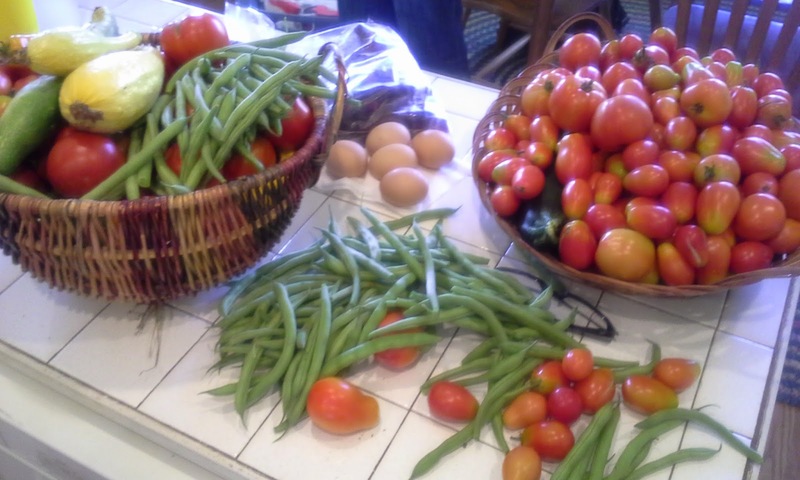 I love this time of the summer, when you go out to the garden and bring in the harvest. This is what I saw on the kitchen counter this afternoon. Fresh green beans (which Llewellyn cooked for supper, mixed with fresh onions also from the garden), squash, peppers, cucumbers, zucchini, and tomatoes (lots of Roma, with which Llewellyn has already canned a number of jars of spaghetti sauce for the winter). You can also see fresh eggs gathered from the hen house. We have the best layers I think we've ever had (thanks to the Hamricks!). There's also a freezer bag filled with blackberries picked from bushes growing in our ditch facing Plank Road! "For as the earth bringeth forth her bud, and as the garden causeth the things that are sown in it to spring forth; so the Lord GOD will cause righteousness and praise to spring forth before all the nations" (Isaiah 61:11).